War history has always intrigued me. Although I have never been so unfortunate as to be involved in any wartime conflict, I have tried to use my feeble imagination to comprehend the horror, confusion, and irony that often takes place during wartime situations. Saints and Soldiers brings much of this irony to the forefront as four soldiers who survive the infamous massacre at Malmedy, Belgium seek to avoid further capture in the December winter of 1944. Survival turns into a mission to save American lives when a British intelligence officer named Oberon Winley (played by Kirby Heyborne) is discovered hanging by his parachute in a nearby tree after his plane goes down. In possession of information that must be delivered to the American lines, Winley seeks the help of his American allies. With this, the plot is set. However, anyone who thinks this is merely an LDS "Saving Private Ryan" is wrong. In fact, unless you are able to detect little hints scattered throughout the film, you would barely comprehend that the main character in the film, Corporal Nathan 'Deacon' Greer (played by Conrad Allred), is a devout Mormon who fervently tries to live his faith under incredibly terrible circumstances. Haunted by an incident that took place on the same day of the massacre (December 17, 1944), Greer is an expert shot with a rifle who speaks German fluently enough to fool German soldiers. We learn early in the film that he doesn't drink alcohol, smoke tobacco, or "even drink coffee" and that he hails from a small Arizona town called "Snowflake." Greer also carries a small book that he is occasionally seen prayerfully reading. His hesitation to shoot a fleeing German soldier causes atheist corpsman Stephen Gould (played by Alexander Polinsky) to question Greer's competence. Gould wonders why Greer can't see the enemy as someone to be hated. He learns later that Greer learned to speak German while serving as a missionary in Berlin prior to the war. Unless you already know that Snowflake is a small Mormon community and that abstaining from coffee is a unique trait of Mormonism, the idea of a former missionary reading from a small book wouldn't signal that the word "Saints" in the film title is referring to a "Latter-day Saint." Most people unfamiliar with these LDS nuances might wonder why a guy as young as Greer was serving as a missionary (the typical stereotype is that missionaries are "older" folks), but in actuality Saints and Soldiers does not rub Mormonism into the viewer's face. These are about the only clues given throughout the whole movie; the word "Mormon" is never mentioned, and the audience is not given the title of the book he is reading. 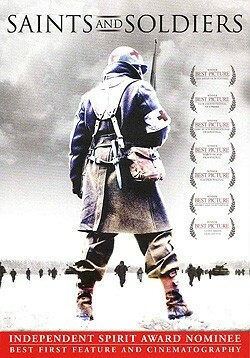 The film opens with American soldiers using metal detectors to sweep a field. Historically this is very factual as that is how they discovered the snow-covered bodies of more than 70 American prisoners who were gunned down near the Baugnez crossroads outside of Malmedy. I was curious as to how the film would depict the massacre since there has been conflicting information about the incident since the day it took place. In the 1965 epic film "The Battle of the Bulge," American prisoners are rounded up in a field as German trucks back in towards them. Tailgates drop and machine guns mercilessly shoot at the prisoners as they stand helpless or scatter for cover. Saints and Soldiers takes what could be a more balanced approach that is not without some level of eyewitness support. As the Germans search the prisoners, one prisoner tries to escape and is shot down by a guard. This causes panic and confusion that leads to more gunfire and additional dead soldiers. One scene shows an American picking up a German rifle and firing back. This may have well have happened; if so, the killing of at least some of the soldiers could be considered justified under the context of war. The film does not reveal the fact that about half of the prisoners survived the massacre, but then, I see no reason why Saints and Soldiers should be responsible for going into this kind of detail. It isn't a documentary. The cinematography and acting were top notch, though I barely recognized Kirby Heyborne. No doubt many Mormon viewers will be disappointed with his regular cigarette smoking and occasional four-letter words. Heyborne is a former Mormon missionary and has starred in many Mormon genre films, including The R.M., The Singles Ward, The Book of Mormon Movie, and The Best Two Years. His role as Oberon Winley was very impressive and quite a change from the comedic parts I've seen him do in the past. Allred also plays his role as "Deacon" Greer very well. It isn't difficult to understand his reluctance to hate the people that he earlier tried to evangelize. Not that the film implies this, but we must understand that this is not just a dilemma faced by Mormons during war. I am sure many Christians found it terribly paradoxical knowing that many Germans were fellow Protestants, many of whom were of Lutheran background. Christians killing Christians is the epitome of contradiction. Though I don't at all consider myself a pacifist, it is difficult to escape the logic in this context. The film claims to be based on actual events, but how far that goes is anyone's guess. Except for the part when a German two-man patrol stops at the farmhouse where the five men are hiding, much of the movie is very believable. Without giving away the scene, let me say that I find it hard to believe that one of the soldiers just happened to be a young man whom Greer taught while on his mission in Berlin. While this encounter may stretch our credulity, this scene is necessary later on in the story line. All in all, I liked the film. Let me assure you it is not Mormon propaganda although the title may fool some into thinking it is a reference to traditional Christians and not a reference to a Mormon. I think that just about anybody who is interested in films about WWII will find it enjoyable. Finally, for more reviews and information on Saints and Soldiers, click here.